ultimately absorbed by the Springs and its respectability . 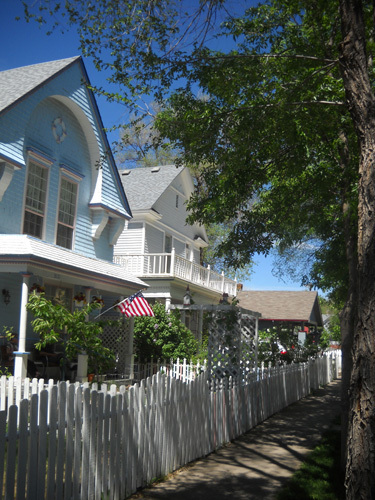 . . "
Old Colorado City is the oldest city in the Pike's Peak Region. 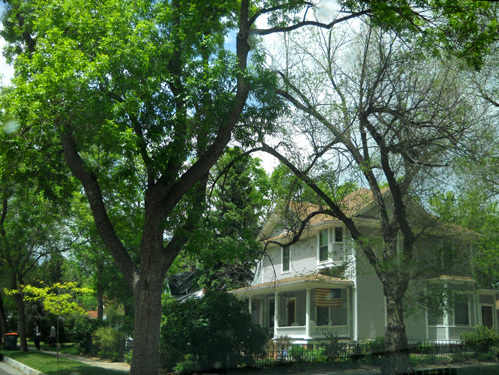 Established in 1859, and designated the first capitol of the Colorado Territory in 1861, it was annexed to Colorado Springs in 1917 and restored as the city's only National Historic District in 1977. 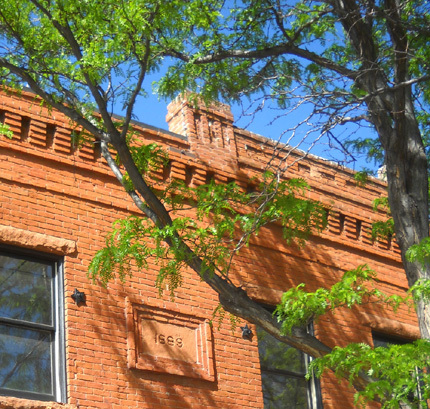 Some of the old 19th Century retail buildings also still exist on and near Colorado Avenue between 24th and 28th Streets. 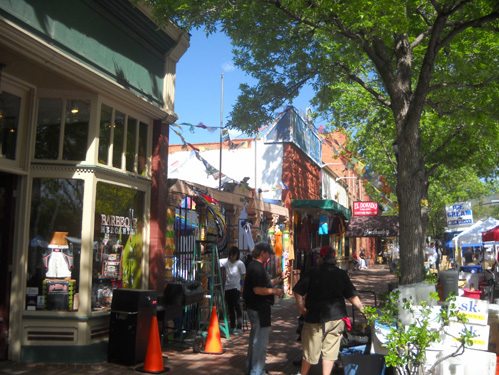 They house specialty shops, restaurants, art galleries, and other businesses. What's here now is a far cry from the saloons and brothels that used to line this street. One way Old Colorado City tries to preserve pieces of its past (such as 19th Century farm and ranch life, local industries and businesses that outfitted and entertained the folks heading farther west for the gold boom and silver rush, mills to process the ores, the railroad, destructive fires, wars with Native American Indians, schools and libraries, high society balls, etc.) 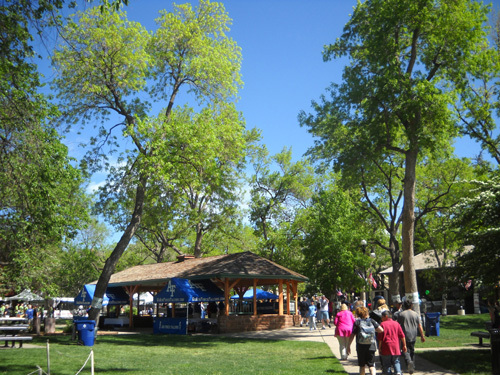 and help to ensure its economic future is to sponsor various events throughout the year that entice visitors to come and spend their money in a fun atmosphere -- art walks, music and dancing in Bancroft Park, car shows. food festivals, and special holiday events at Christmas, Halloween, Labor Day, and Easter. 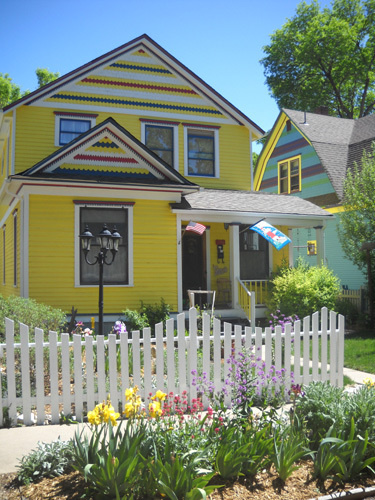 Probably the largest event is the annual Territory Days festival on Memorial Day Weekend. When the weather is good, as it is this weekend, the three-day event typically attracts over 100,000 people. 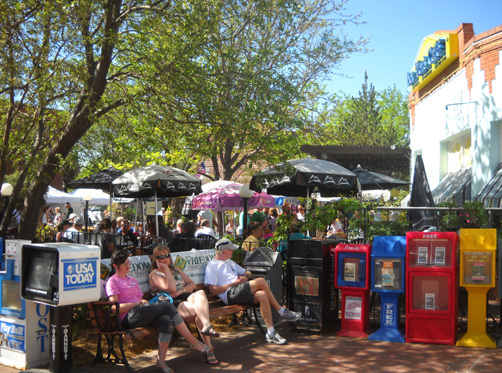 This is the 35th year for the street festival, which has a wide variety of activities, arts and crafts, historical displays, and music for people of all ages. Entry is free, although some optional participatory activities charge a fee, such as pony rides, mechanical bull rides, and a climbing wall. 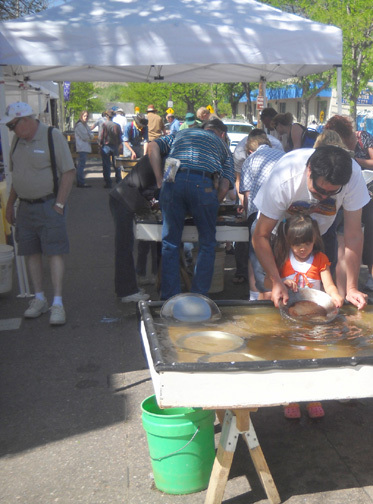 Other activities like gold panning (below), kids' train rides, and music on the street and in the Bancroft Park band shell are free. 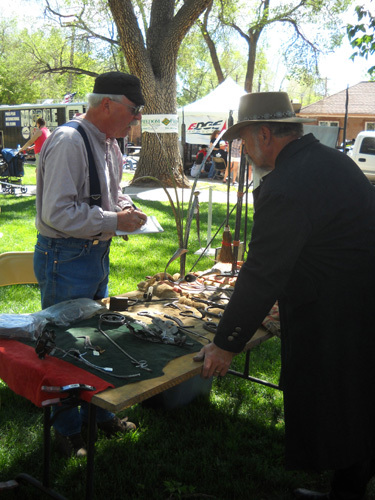 volunteers dispensing area lore at the historic Garvin cabin and the Old Colorado City Historical Society tent, and blacksmiths demonstrating their craft. Visitors could also check out authentic Indian tipis, a chuck wagon, and historic photos. We thought it'd be pretty cool to check the festival out. I mean, it's free and it wasn't much of a drive. How could we go wrong? Some of these events can be really fun. Our idea of what was fun was probably different from what the majority of the other visitors thought was fun, however. We kind of knew what to expect from the promotional literature we'd picked up. We knew one thing for sure: we needed to arrive early to avoid the heat and largest crowds, and to get a decent free parking space along the street. We didn't want to ride a shuttle, and some businesses and churches were charging folks $10 to park closer to the festival. 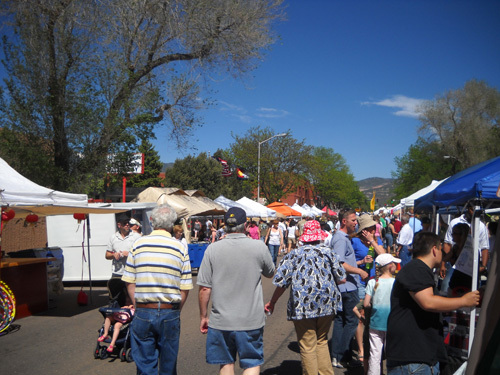 The festival was advertised as open from 10-7 today. We got there about 9:15 and scored a nice, shady, *free* parking spot on a side street a couple blocks from one end of the area closed off for the booths on Colorado Avenue. We wandered over to the festival area even though we were early, just to see what was going on. Most of the vendors already had their booths set up and were ready for early birds like us -- kinda like at yard sales, where sellers know some folks want to be the first ones there for the best pickings! 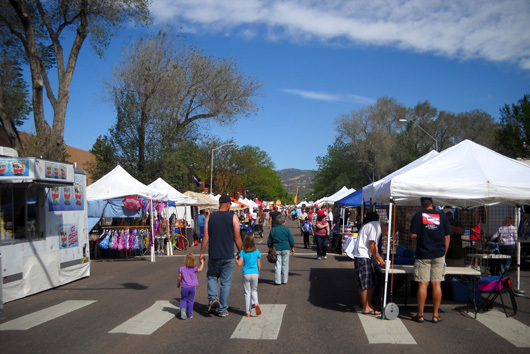 About 200 street vendors stretched four blocks up Colorado Avenue. Some of the booths surprised us. There were a lot of crafts but very little of what I'd consider art. That disappointed me a bit. 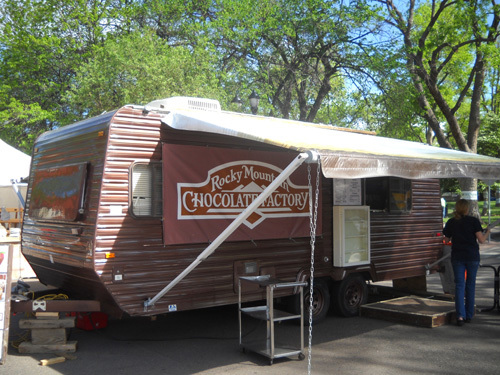 The trailer looks like it's been dipped in chocolate! We thought we struck gold when we found a booth with homemade baked goods; we bought a loaf of delicious basil/asiago cheese bread to nibble on as we walked around the festival and enjoyed the rest of it later with meals. That's the one and only thing we bought today. What surprised us the most about the displays were all the commercial vendors who had booths, ones we've never seen at a festival before -- Direct TV, phone companies, Andersen Windows, Subaru, even Home Depot!! Jim pets a well-behaved Cody look-alike at the "Sit Means Sit!" booth. Dogs were not allowed into the festival area so we were a little surprised when we came to a booth with both a black Lab (a dead ringer for Cody) and a standard poodle, each sitting perfectly still on its own little trampoline as hundreds of people walked by and/or petted them. 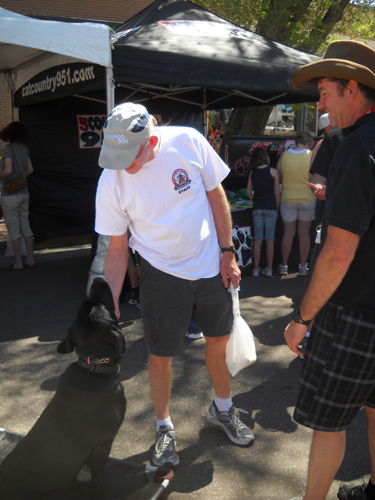 The booth was manned by the man who runs a dog training business called "Sit Means Sit!" It was fun to pet the pooches and talk to the trainer. Now there's a job Cody would love! The Air Force Academy had a strong presence at the festival, which was appropriate on Memorial Day weekend. Several officers and cadets manned their display in the large Bancroft Park shelter (below). We saw lots of visitors go inside to pick up literature and learn more about the Academy. 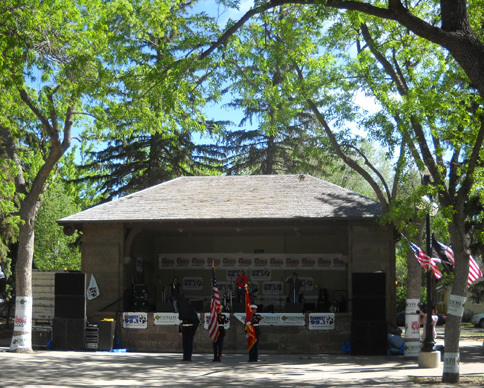 I just happened to be nearby when I saw a military salute in the nearby band shell; I didn't see it listed in the program. 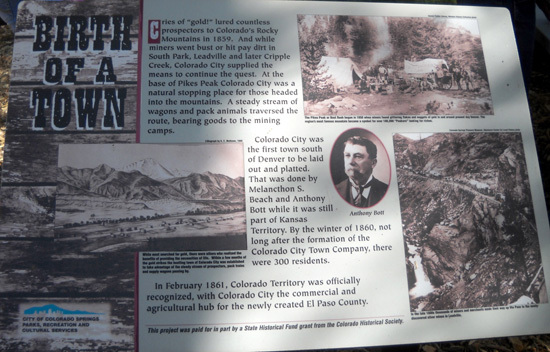 There were several signs erected in the park with old photographs and information about life in the area in the late 1800s, when Old Colorado City was a natural stopping and re-supply center for the gold (and silver and lead) rush towns to the west. 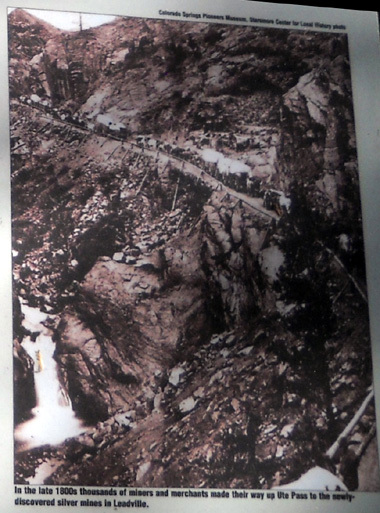 I realize it's hard to see, but it shows miners and merchants in wagons heading to the Leadville silver mines in the late 1800s on a very narrow, wooden "road" dangling precariously on the side of a cliff at Ute Pass. 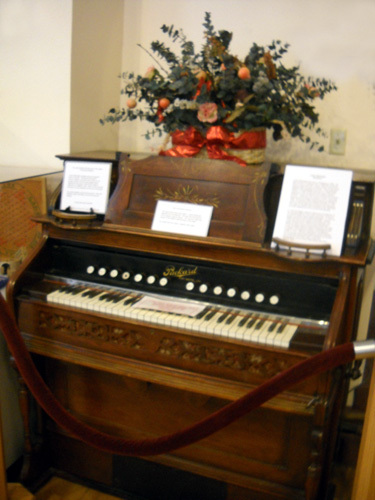 It's worth a trip to the Colorado Springs Pioneer Museum to see it up close! Jim and I often marvel at the remains of mines and related buildings we see perched on sheer cliffs at 10,000 and 12,000 feet in the air near Silverton and Leadville and Cripple Creek and other Colorado mining areas. This is as death-defying as that boarding house high above Cunningham Gulch near Silverton! If you've ever been to the Hardrock Hundred ultra marathon, you probably know what I'm talking about. 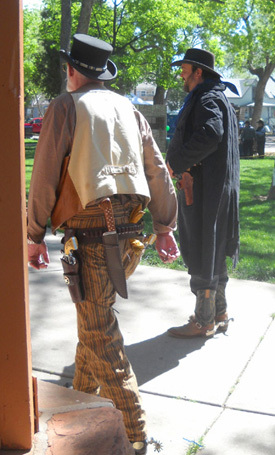 Those were some tough hombres. 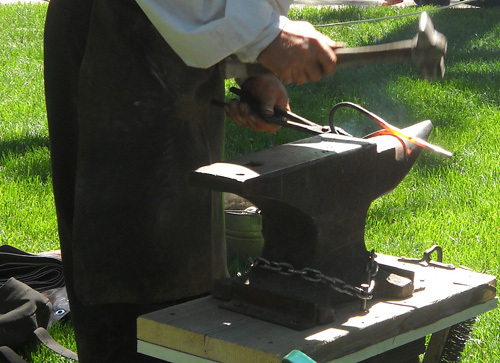 We watched the blacksmiths for about ten minutes, then headed across the street to visit the Old Colorado City History Center. 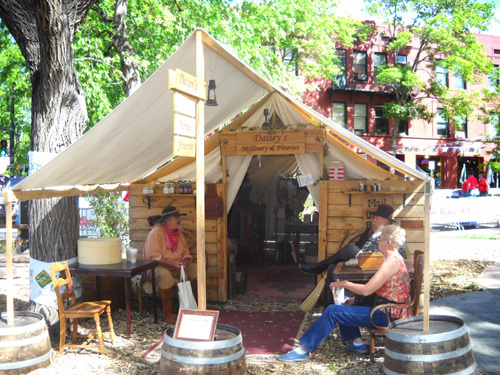 While most festival-goers were enjoying the vendors' booths, musical entertainment, gold panning, beer, and BBQ, Jim and I were more interested in the historical aspects of Territory Days. 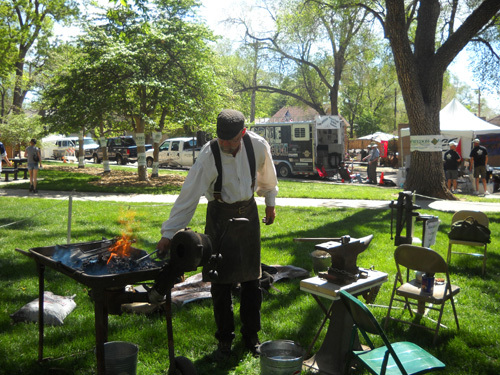 We spent as much time in the History Center, Garvin cabin, Old West camp store, and blacksmithing area as we did wandering around the street festival. 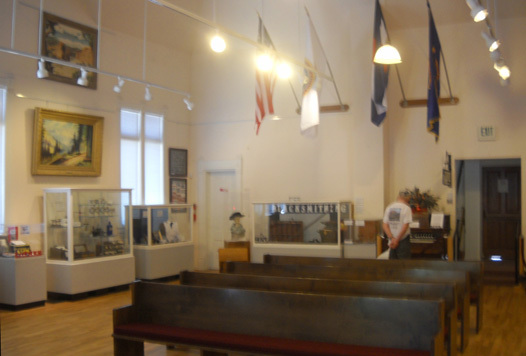 The History Center is a non-profit organization operated by volunteers of the Old Colorado City Historical Society. 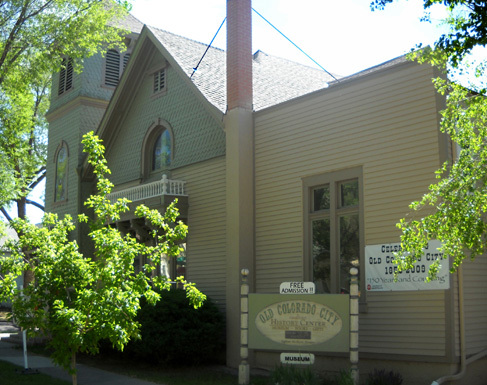 The museum is housed in a former Baptist church on 24th Street that was originally built in 1890. 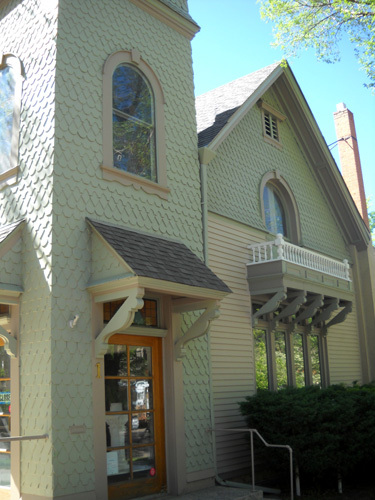 Architect Walter E. Douglas also designed other churches, houses, and buildings in Old Colorado City. 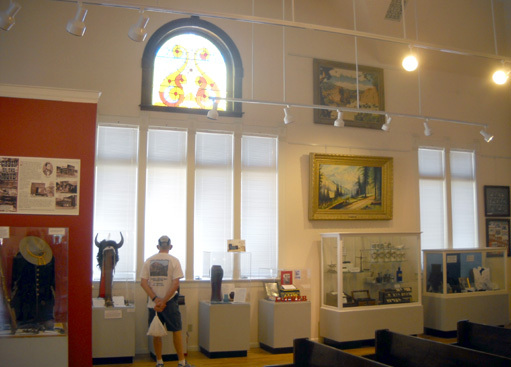 The Historical Society bought the church building in 1992 and renovated it into a bright, airy space for the History Center. It is open to the public Tuesday through Saturday from 11-4. Admission is free. 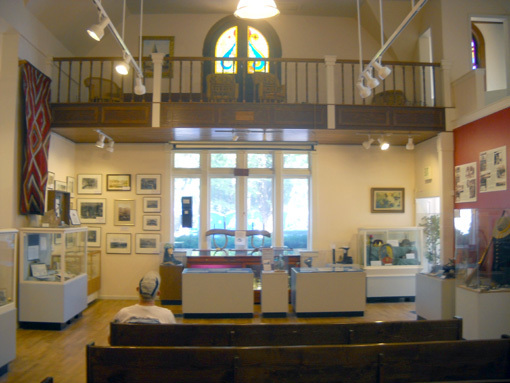 The History Center has numerous displays and photos of 19th and 20th Century life in the Old Colorado Springs area. 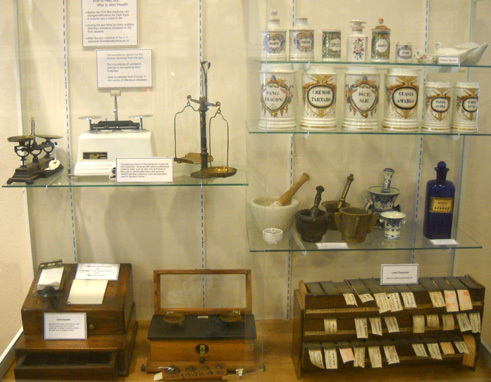 Exhibits include hand-blown (and later, mass-produced) glass bottles for mineral water, liquor, wine, and beer made in the area, photos of the gold ore reduction mills, post-Civil War medical supplies, information about the cog railway on nearby Pike's Peak, and many other subjects. 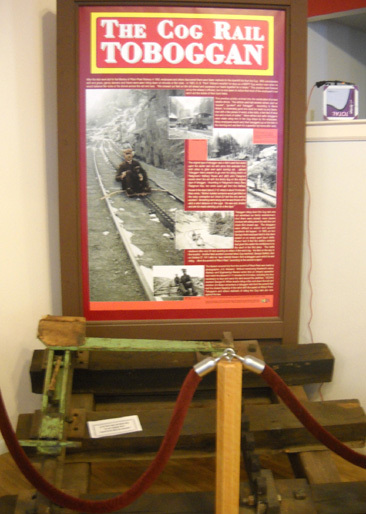 One of the more interesting displays describes how folks, mostly railroad employees, used to descend the cog railway from the top of Pike's Peak down to Manitou Springs on flat rocks, homemade "toboggans," or other rickety (and risky) contraptions. This is part of the narrative on the display: "After the rails were laid for the Manitou & Pike's Peak Railway in 1890, employees and others discovered there were faster ways for the downhill trip than the Cog . . . The practice was frowned on by the railway's officials . . ."
. . . but no one seemed to notice that the more reliable toboggans were being built by railroad employees with iron and other materials found in their shop! Early seats were flat rocks or shovels. Soon crafty guys were making sleds from "a few pieces of wood, a few bolts, a few feet of strap iron, and a hunk of rubber." "Many employees would carry their toboggans up on the train in the morning and use them for a speedier trip home after work." The rumored speed record (you know someone had to be the fastest!) 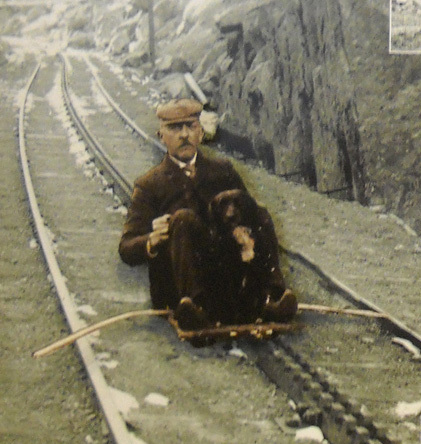 to descend the almost-nine miles of rail via toboggan -- including the time necessary to carry his sled over the switches at the halfway house -- was 11 minutes by a photographer named J.G. Hiestand. Do the math. We figure that's almost 50 MPH descending 7,000+ feet on a piece of wood on bumpy iron cogsl!! Good grief! When you read about the difficulty of controlling the toboggans -- let alone the other less sophisticated devices used as seats -- and the resultant accidents, injuries, and even deaths that occurred before the practice was banned, you can only marvel at the guy's speed. (He lived to brag about it.) Most folks went slower than that but it was still a risky venture. Sure sounds like fun, though, doesn't it?? I think that exhibit alone was worth visiting the History Center! 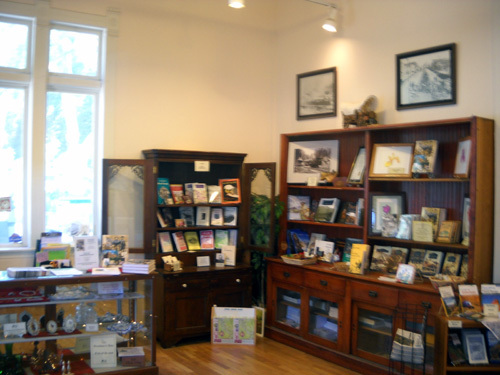 In addition to the artifacts, photos, and written information in the displays, the History Center has a corner (above) in another room with lots of interesting history books for perusal or purchase. I could have spent a lot more time in the museum, but as you can see in one of the photos above, Jim maxed out before I did and had a seat in the front pew while waiting for me. 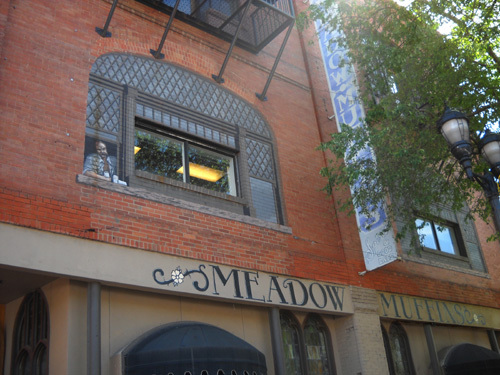 Maybe I'll just go back the next time we're in Colorado Springs and read some more historical anecdotes . . .